This mod overwrites some scripts of the Religion – Prayer Meditation Worship mod by IronDusk33 to make some of the sins and virtues more logical, in my opinion. I have also added guide books to immersively guide you through the mod. 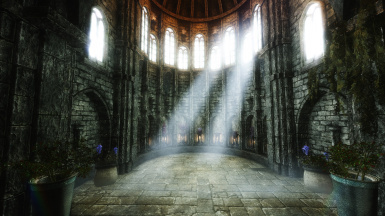 Religion - Prayer Meditation Worship You MUST download this mod first, let my scripts overwrite. Please do not re-upload my mod. If you would like to make book textures or an SSE conversion, please contact me. Thank you to IronDusk33 for his 'Religion - Prayer Meditation Worship' Mod. I adore IronDusk33’s Religion Mod and for me, it is essential for a realistic playthrough. However, I became so interested in this idea that I decided to dig deeper into the mod files to get a better understanding of the mechanics. I also started coming up with my own ideas of sins and virtues as I learned more about each Divine. So, I decided to make some changes myself! This mod requires IronDusk33’s original mod (version 2.06 only), this mod will simply overwrite some of its scripts. 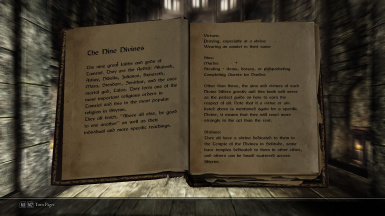 The optional .esp added by this mod adds two new books to guide you through pleasing the divines with my changes. These books will be explained more below. I believe my script changes make the Divines easier to follow in a logical way since the sins and virtues directly relate to their specific teachings and common knowledge of the lore. Furthermore, with these changes you can now still please some Divines whilst displeasing others since their values are so different. I decided to leave the Daedra worship side of the mod alone since I don't feel like I know enough about them to make such changes. 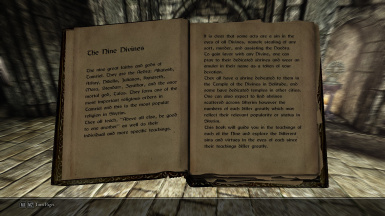 The first book is called ‘The Book of the Divines’ which is basically a lore book which will explain what I know about each divine and immersively hint at the sins and virtues related to each without being blatantly obvious. This book is rather wordy and may require some thinking to figure out what the sins and virtues might be. You can find several copies of this book free to take in baskets inside the Temples of Dibella, Kynareth, Mara, and Talos. The second book is called ‘A Worshiper’s Guide to the Nine’ and is almost a little ‘cheaty’. It will basically provide you with a clear list of the sins and virtues for each divine. However, I have still tried to keep the wording immersive and not too obvious. For example, rather than writing ‘killing Paarthurnax’ under the sins for Akatosh, I wrote ‘killing harmless dragons’ instead. If any of these clues are still too difficult to figure out, you can find the exact sins and virtues in a spoiler below, or if you don’t want to look at that, feel free to message me and I’ll tell you exactly what they mean. I urge you to read the first book before this one to gain an understanding of the reasoning behind my choices for the sins and virtues as well as having a go at guessing them for yourself. This book is only available to be purchased for a rather high price from Freir in the Temple of the Divines. She will now also sell you some other religion-related books including ‘The Book of the Divines’ and will buy books and spell tomes from you. This is all the information you need to understand and enjoy this mod, and I urge you to only use my guide books in-game as reference. However, if you want to know the changes I have made in the form of a complete list of the sins and virtues for each divine, you can click the ‘spoiler’ button below. Other than these, the sins and virtues of each Divine differs greatly. Note that if a virtue or sin listed above is mentioned again for a specific Divine, it means that they will react more strongly to the act than the rest. I am looking for an artist who could retexture the book covers to make them fit in with the retextures in Book Covers Skyrim. Please send me a message if you could do this for me. Feel free to post in the comments if you disagree with any of the sins or virtues and tell me why. IronDusk33 gave me his permission to upload these scripts. However, this mod is only intended to work for version 2.06. He may be releasing an update of his mod soon and although that is very exciting, I may not be updating this mod, at least not immediately. Please remember to endorse my mod as well as IronDusk33’s original mod if you enjoy. Please feel free to upload any relevant screenshots.